Welcome to the Pack 32 website. Our pack serves the boys and girls at Eakin Elementary School and throughout the neighborhood. We will have information available here about upcoming pack events, the pack calendar, and contact information for the pack leadership. We meet every Tuesday night during the school year in the Eakin Elementary School cafeteria. Come join us! Show your Cub Scout, Pack 32, and Eakin pride all in one shirt. 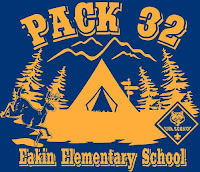 Pack 32 T-Shirts are available to order and will feature this design. The cost per shirt is $9. Please contact Ben Whitehouse and advise on the number of shirts requested and size. Youth and adult sizes are available. Pack 32 families. Please join our private facebook group. For the safety of our Scouts we will only post photos from our events and activities there, where we can limit who has access to them.